The Libyan coastguard has arrested two tankers suspected of smuggling petroleum products following a gun battle which erupted when the vessels refused coastguard orders to stop and be boarded. “The clashes lasted for three hours, but the two tankers were successfully seized,” said Commodore Ayoub Qasim, the Libya naval forces spokesman. 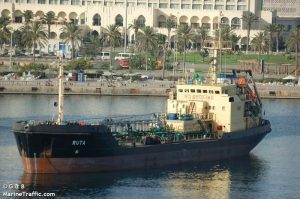 The tankers were seized yesterday off Zuwara, 120 kilometers west of Tripoli. No one is said to have been hurt in the shooting. According to Qasim, one of the tankers is the Ukrainian-flagged Ruta while the other, the Stark, is from an African country. He did not name the country, however an oil tanker of the same name is registered in the Democratic Republic of Congo. According to MarineTraffic.com, both tankers had sailed from Turkey and were heading to Malta. At present there are no details on where the vessels or their crews are being held, or what their nationalities are. The coastguard has been congratulated by the Presidency Council for arresting the two tankers.